When I was a bit younger and a bit braver, a group of friends and I shot the rapids on the Ocoee River in southeast Tennessee. 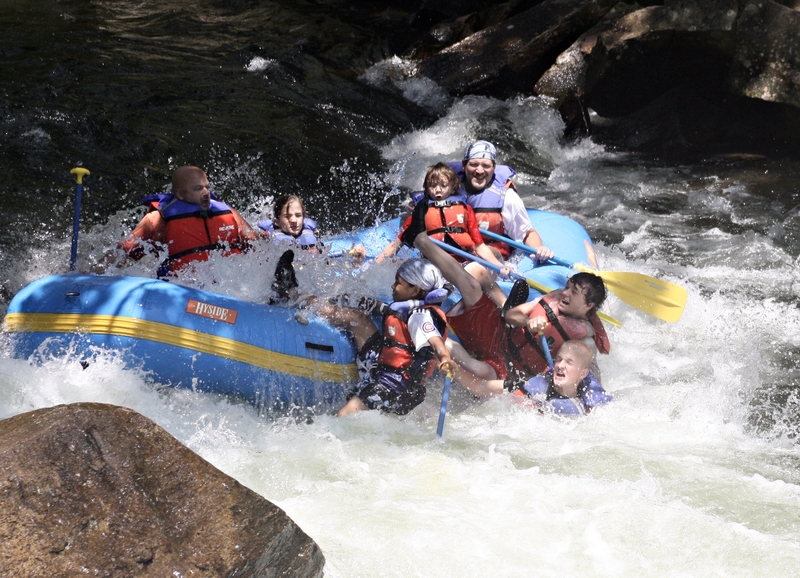 The Ocoee, which I think is the Cherokee word for “terrified rafter” is a world class whitewater adventure. Now, I’m no world class athlete, and that became evident on the river. I so feared being sucked out of the boat that I literally dug my toenails into the rubber raft I was paddling. But by the time we finished, I was on a first name basis with rapids named Broken Nose, Table Saw, and Diamond Splitter – and it was an incomparable thrill. Whitewater sports began quite accidentally on this river. The Ocoee is dammed to produce electricity. The Tennessee Valley Authority (TVA) has operated their dams for years, and for the longest time, TVA’s production of electricity killed the river. Only a trickle of water, no more than ankle deep in places, flowed through the gorge. But in the late 1970s a portion of one of their dams broke, sending the full force of the Ocoee through the canyon for the first time in decades. Whitewater outfitters and kayakers jumped all over the opportunity, setting up impromptu river tours. After the dam was repaired, legislators were wise enough to pass laws to protect the recreation that had developed on the river. So, for 112 days a year the Ocoee River is “turned on” for kayaking and rafting enthusiasts. He was right. The water was coming. Thirty miles upstream the water had been released. It took a little while to get there, but as I watched, the babbling stream turned into a torrent of whitewater, and the adventure was afoot. The power of those rapids was incredible. I couldn’t dictate to the river with my little paddle and rubber dinghy any more than I could turn on or off the dam’s floodgates. There was no control over the water; I had to go where it pushed me. Sure, at times I could steer, paddle or even stop, hiding behind a huge rock; but when released over the rapids all I could do was scream, flay at the water, and pray. The power of the water had been unleashed, and we were just along for the ride. Living out the life of faith is a lot like that. We have our raft, paddle, and are in this boat with our friends on the same journey. What began as a dribble is now an unstoppable flood. We are paddling along best we can, moved by the unleashed Spirit of God. And sometimes we are more than moved. Sometimes life and faith are not placid escapades of reflection and peace. Instead, the journey of faith becomes a bone-jarring exercise in survival, crashing over the rocks and through the rapids, threatening to drown us. We are often jostled from the security of our raft, forced to scream out of desperation for a rope or lifeline of rescue. We struggle and fight just to keep our noses above the water line. We may get the relieved opportunity to list in quiet pools, catching our breath and resting our muscles from time to time. But then, the water will pick up and we are on our way again. Sure, there are things we can and should do along the way: Pray, hang on, watch out for our friends, and paddle like our hair is on fire. But ultimately we are riding the wave of God as he does his good will and purpose. His power has been turned on in our lives, and all we have to do is hang on and let it take us where it will. New Audio from Ronnie entitled, “True Grit: Living the Way of Jesus” (#3) at Ronnie’s Audio Page. 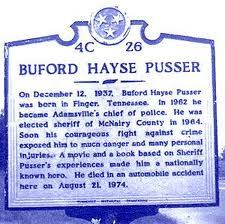 Buford Pusser was born and raised in Adamsville, Tennessee. As a young man he moved to Chicago and began an aspiring career as a wrestler. He was known as “Buford the Bull” in the ring, and somehow the Bull gained the attention of Ms. Pauline Mullins, another small-town immigrant from the hills of West Virginia. The two fell in love and were married, and Buford traded in his wrestling tights for something that better paid the bills. He and his family moved back to Adamsville, Tennessee where he took his first job as a law enforcement officer. Finding that the profession suited him, Buford entered the race for Sheriff of McNairy County, Tennessee, and in 1964 and he was duly elected. He then went to work cleaning up the illegal operations on the Tennessee-Mississippi state line which included gambling, prostitution, moonshine whiskey, and extortion. Buford the Bull stormed into the fray, “Walking Tall” as the movie made recounting his life told it, fearlessly hauling in moonshiners, closing down brothels, and jailing prominent members of the Dixie Mafia and State Line Mob in his county jail. His enemies were none too pleased with this new sheriff and tried to get rid of him dozens of times. In August 1967 on his way to the State Line there in McNairy County, Buford and his wife Pauline were ambushed near New Hope Methodist Church in a hail of gunfire. Pauline was killed at the scene and Buford, seriously wounded, was left for dead. But dead, he was not. He recovered his health and within a few years three of his wife’s alleged assassins were dead under questionable circumstances, and the fourth was locked up at Angola. In the movies Buford Pusser leaves his hospital bed, still covered in bandages and his own blood, and with a big stick and a bad attitude metes out vengeance on those who killed his wife. His is the iconic image of a two-by-four welding man in a Tennessee road house, kicking tail and knocking heads. And it seems some theologians want to paint Jesus the same way. But we, in fact, worship a God who was beat up. He was stepped on and bullied. He was as a sheep before his shearer is dumb; he did not open his mouth in protest. God, at his very best, at his holiest, when he most deserves the adoration of his followers and of his church, was when he was dying, weak and powerless on a cross, when he was in the violent hands of men and religious and political systems that had crushed him in their grip.